How can you create the ultimate master bedroom?? Here are some elements to consider. If your home is a sanctuary, then your master bedroom is the inner sanctuary, a peaceful and restive place where you can relax, rejuvenate and cast off the cares of the day. If your master bedroom is less than Zen-like, there’s no better time than the present to redesign it to fit your needs, paying close attention to color, pattern, texture, and accessories. In choosing a color scheme for your master, remember the adage that “less is more.” Rather than a multi-colored palette, consider using just two or three colors in hues that enhance relaxation and sleep. Monochromatic color schemes, which are derived from a single base hue, are perfect for master bedrooms as are analogous color schemes, which use two or three colors that lie close together on the color wheel. Both color schemes are pleasing to the eye and invoke a feeling of serenity. Contrasting color schemes can work, too, as long as the hues aren’t too overpowering and are offset by a comforting neutral. Colors that work well in master bedrooms include neutrals (whites, off-whites, grays, taupes and beiges), naturals (earthy greens and browns, oceanic blues, blue-greens and terra cotta), pastels (whispery pinks, mint green, periwinkle and soft peach) and mid-tones (neither too light or too dark) of many of the aforementioned colors. Metallic colors are becoming popular, too, especially when layered with neutrals like white or cream. If you want to introduce a brighter color, use it sparingly and make sure the hue isn’t too jarring. Bedding, window treatments, upholstered headboards, area rugs, benches, easy chairs and ottomans all have the potential of adding gorgeous pattern to a master room. If possible, stay away from tiny, busy images and opt for larger patterns or tone-on-tone effects. Some of the most popular bedding patterns at present are truly large in scale and include extra wide stripes and polka dots, chevrons, airy florals, color blocks and watery abstracts. Classical patterns, such as fleur de les and paisleys, also are back in vogue, but have been updated to reflect the latest trending colors—and often they, too, are large in scale. It’s OK to mix patterns but do so with caution. Try to keep the patterns within the same color scheme and the proportions in balance. To create a mix of throw pillows on your bed, for instance, choose a couple in the same pattern as the main bedspread or comforter, a couple more in a slightly different pattern and then one or two in a solid color, to tone down the busy-ness. Textures in a master bedroom add an extra degree of comfort. There’s nothing like diving at the end of the day into a comfortable pile of lush linens and fluffy pillows! In general, the textures you incorporate into your master largely are driven by your home’s style and your own preferences. But they also are influenced by geography. If you live in a warm climate, you might consider smooth, satiny linens, cool tile floors, area rugs in natural fibers and minimalistic furniture pieces with clean lines. If you are in a cooler climate, you might lean toward layered linens, plush carpets, velvety upholstery and heavy furnishings in warm wood tones. And don’t forget the walls! Texturized paints and other decorative paint treatments, such as glazes and plasters, are perfect for master bedrooms, allowing you to personalize a space that already is very personal. The same goes for wallcoverings. Today’s wallcoverings run the gamut from metallic-infused and natural-fiber wallpapers to ribbed, pleated and flocked designs. 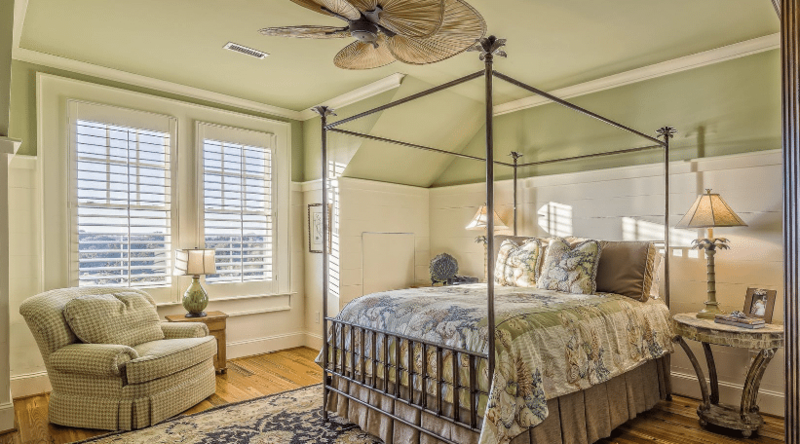 You can install wallpaper throughout the room, behind the master bed to create an accent wall or halfway down the walls as “wainscoting.” Another way to create a texturized accent wall is to install wood planks or shiplap behind the master bed. Suitable for any bedroom but especially cottage styles, this look also adds a feeling of coziness. To make your master more masterful yet, carefully select accessories that add to the overall effect you want to achieve. Accessories can be functional (mirrors, reading lamps and jewelry boxes) or aesthetic (candles, artwork and flower vases). Regardless, try not to clutter the room with too much stuff, as this will take away from the serenity of the space. Additionally, keep the illumination soft, opting for a variety of light sources—a mix of table lamps, floor lamps, sconces, hanging lamps and ceiling lamps—rather than one main lighting fixture. If your room accommodates it, try to create a small seating area to help you get the most relaxation from your room. A seating area also is a good selling point for potential buyers, if you choose to sell your home in the future. Even if all you have is a small corner, try adding a small-scale chair and floor lamp for reading. With these tips in mind, you can create a bedroom space that invites you inside each evening and helps you wake refreshed in the morning. For more ideas, visit your local paint and decorating retailer, who can offer advice in all of these areas and more.